Micromax’s new smartphone A240 Canvas Doodle 2 boasts of a bigger screen (a whopping 5.7in) and smooth stylus which can bring doodles to life – that is, if you are a fan of scribbling on your phone. The tagline ‘Your Canvas CAN be bigger’ couldn’t have been more appropriate. What I like about the campaign is that the creatives are replete with fun doodles that bring out the top features of the phone. The brand used the large canvas (pun intended) of Yahoo!’s Email login page to create a clean and great user experience with their branding (Yes, that’s possible!). Check out the shot below. 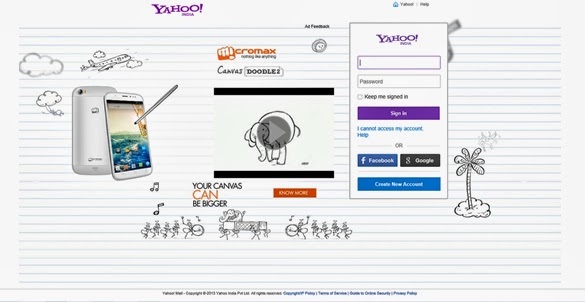 Featured posts on Twitter were also used to drive audience to the Doodle 2 A240 page on the Micromax website. I wish they would use the campaign theme to come up with an interactive promo even if only for their social media fans. What do you think?